Two winners at the Cannon County Science Fair also proved to be tops in their class at the Regional Science Fair, held March 26 at Tennessee Tech as three Auburn School eighth-graders received the blue ribbon for first place. From left, Chloe Fann won first place for the second straight year, and Paige Tenpenny and Lauren Turney teamed to capture first place in the biology division. Fann won the math division. The students are shown with their winning projects. Three Auburn School eighth-graders proved to be among the best of the best when they competed in the 57th Cumberland Plateau Regional Science Fair at Tennessee Tech March 26. Chloe Fann became a repeat winner when her entry, “Don’t Forget the Food Next Door,” earned first place in the Junior Division (7th-9th grade), competing in the mathematical category. Fann also finished first at the regional fair in 2010. Classmates Paige Tenpenny and Lauren Turney teamed to take first-place honors in the Biological Category for their entry, “Can You See Me Now?” They also were competing against ninth-graders in the Junior Division. Having an opportunity to view the other entries in their category made Tenpenny and Turney appreciate their win even more. Fann was nominated to compete as a Broadcom Master for outstanding performance at an SSP-affiliated fair. 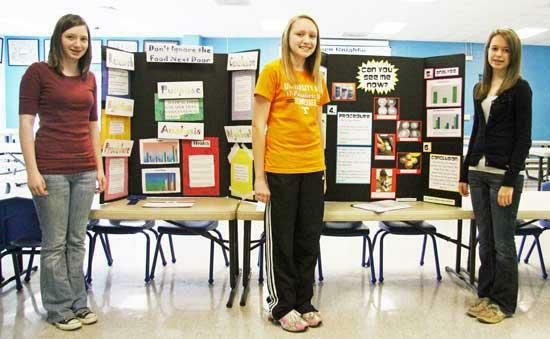 She will answer essay questions about her project and have an opportunity to compete at the 2011 National Science Fair. Fann wanted to determine if all the hours her family spends in the garden is worth it by comparing local food to conventional food. Her hypothesis was that local food is cheaper than conventional food in cost, impact on the environment and health. By comparing the cost of conventional food, self-grown food, food that you buy at a farmers market, and the cost of regional food, and calculating food miles, or the number of miles that food travels before it reaches the store, Fann’s hypothesis was correct. The purpose of Tenpenny and Turney’s project was to see what contact solution will sterilize bacteria the best. Their hypothesis was, based on research and review of the ingredients, Opti-Free saline solution would sterilize bacteria best. After applying procedures and comparing solutions, they arrived at the conclusion Opti-Free Saline Solution sterilized the bacteria best overall, killing almost 95 percent of the bacteria over a 5-hour period. “I wanted to use the project for my sake, not just for the grade or because we had to, but I wanted to know I wasn’t damaging my eyes because I wear contacts,” Tenpenny said. 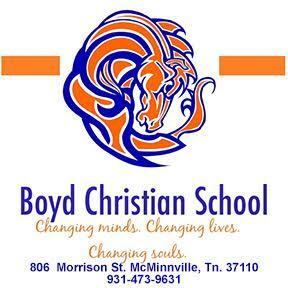 More than 200 students from 16 counties competed in the 57th Cumberland Plateau Regional Science Fair. The Cumberland Plateau Region consists of the following counties: Bledsoe, Cannon, Clay, Cumberland, DeKalb, Fentress, Jackson, Macon, Overton, Pickett, Putnam, Scott, Smith, Van Buren, Warren, and White.